I’ve never really known how to categorise or tag Murnane’s fictions, but have used the term conceptual literature (because other people do) to describe the strange haunting image-worlds he creates, but this memoir is grounded in reality. Unlike The Plains (1982); Inland (1988); A History of Books (2012) and A Million Windows (2014) (and see a Sensational Snippet) Something for the Pain is deceptively easy reading. Although the reader spends a lot of time in the arcane world of horse-racing, it’s not like wandering through image-houses with image-persons in dream-landscapes as one does when reading Murnane’s fictions, and although he takes the reader through selective aspects of his own personal history as he did in A History of Books, Murnane seems not to demand as much of his readers in this memoir. To put it another way, reading this Murnane is not like reading Murnane! 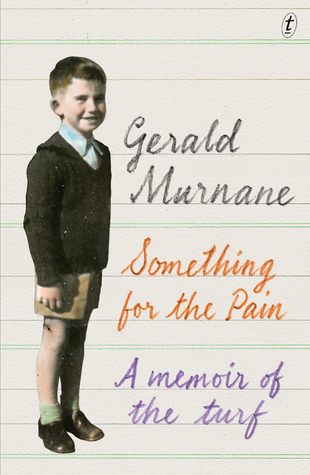 Something for the Pain is rightly subtitled ‘a memoir of the turf’ because it actually reveals very little about Murnane as a person, other than his obsessive interest in horse-racing. Everything we learn about his childhood is refracted through the lens of his growing interest in the horses. There are very brief allusions to his career as a primary school teacher and a university lecturer, shared in the context of using his salary for betting, or organising time off to get to race days, or spending his weekends at the track. There is nothing about his children, and only a little bit about the death of his wife, Catherine, though there is a poignant allusion to nursing her in her final illness himself because he knew more about her medical history than any of her many doctors and nurses. But we also know he loved her, and took his responsibilities as a husband seriously because he made a pact to give up his beloved horse-racing when they were saving up to buy a house. We hear about an Uncle Louis, and about his father, because they were punters too, (his father disastrously so), but nothing about any siblings and very little about his mother. What this confirms for me is an impression of contented solitude: Murnane is a man most at ease in his own company and not inclined to waste any time on things that don’t matter to him. He has spent his life pursuing his writing and his interest in horse-racing, and other things (like earning a living) have been unavoidable distractions. If he takes time out to do husbandly things like planting vegetables or putting up an occasional shelf, it’s not worth mentioning in this memoir. That’s a rather revealing passage, I think. The verb ‘intruded’; the ten years on a project before showing it; his wife’s indirect observation, and his memory of that observation still bothering him all these years later. In a long marriage where people are comfortable with each other, (or have learned not to bother arguing about some things) much remains unsaid. Yet all of us, from time to time, conjure the unspoken reply in our imaginations so that we can have the last word. Would Murnane, who seems to be a mild man, have liked to have made a retort, I wonder, or merely a calm rejoinder? We do not know. Though he reveals in some chapters more than we really want to know about some personal habits, Murnane is a private man and this memoir offers only a hint of the complexity on offer in his other works. Lovely review and observations Lisa – Gerald Murnane was my teacher when I enrolled at the Prahan College 1981 to do a night course that was the forerunner to the Professional Writing & Editing degree. I’ve kept my first assignment with his paragraph of critique because it was spot on and so encouraging. He sent me a kind supportive letter when I had to withdraw for health and work reasons. John Power of Last of The Knucklemen fame was the other teacher – you couldn’t have got two more diverse personalities, but incredibly inspiring writing teachers together if you tried:) They gave me some direction for my writing path by having faith in my ability. I met Gerald again at a presentation at Melbourne Uni – a quiet achiever indeed. My goodness! That’s the last thing I expected you to say (about Moonee Valley, not the hats)! I had my own little punting system, which meant that if I took $20 to bet with, I nearly always won enough to have afternoon tea in the members dining room. I used to bet on anything that had a legal-sounding name, because I thought lawyers would have enough money to buy good horses. Aha. I have been waiting for your rv of this. It made me realise what a deeply peculiar person Murnane really is and gives me some idea of just how long-suffering his wife must have been. Not that he is intentionally cruel or unthinking, but he truly does live in a world of his own. I was astonished at his description of his ongoing project to write about an imaginary racecourse with detailed descriptions of the jockeys, trainers, and even of the races. I have to say his attitude to music also rather horrified me. And yet as the comment above shows, people who have been his students found him perceptive and helpful, and he spent many years doing a job he wouldn’t have chosen so that he could support his family. I have some acquaintance with him in another context that gave no indication of his real strangeness. An enigma! Yes, I think you can probably guess that I was relieved he hadn’t attached a horse race to any of my favourite Beethoven symphonies! People often make much of his reluctance to travel, but I was more taken aback by his statement that he had decided in middle age that there was nothing more to learn or enjoy from books or music. Well, I would say that wouldn’t I? But seriously, it bothers me when anyone – even someone as intelligent as Murnane – suggests that he/she isn’t open to new ideas or experiences. OTOH he has done amazing things like teaching himself Hungarian, so he’s open to things like that. I’m wary of forming any ideas about his wife or his marriage. He tells us very little about it in his writing, and I couldn’t put my finger on any page that tells me this, but I don’t get the sense that it was unhappy. I’m also wary of being an armchair psychologist… but if we assume that he’s an introvert and perhaps that she was too, they may have been very contented together. You’re right though. My own extended family experience has predisposed me to see such personalities as frustrating for their partners, but of course it doesn’t have to be that way.